Refill toner kits save you up to 87%! Free carriage for orders over £30. Otherwise carriage only £1.95 per refill toner order! Rarely undersold! Tell us If you can find it cheaper! You can have confidence. Our company has been trading for twenty-two years and selling refill toner for thirteen years. Buy your refill toner now! Secure online card payment through Sage Pay. Trusted worldwide! Refilling is easy! Most toner cartridges have a filler plug. You just pull it out and pour in the toner powder using the funnel top provided with each order. For other cartridges you twist open the toner port, or melt a hole through the top surface. The Starter Toolkit contains everything that you need to melt the holes quickly and easily. Choose the make of your printer, fax or multifunction printer to find the toner refills available for your cartridge. We can ship anywhere in the world! Our shopping cart will work out for you the carriage cost and tax (if any) on your order. We are fully committed to providing you with the best quality and service. We guarantee our products 100% and every sale is supported with Refill Toner's no quibble FREE replacement or FULL refund policy. Think of your printer cartridge as a car engine. Do you throw it away when it runs out of petrol? No! You fill it up again. Your printer cartridge just needs more fuel. Do yourself and the environment a good turn! Printer manufacturers sell their machines cheaply and make their money on overpriced consumables. It is the same tactic used with mobile phones! Don't take their bait! Refilling your cartridge is cheaper and easier. The savings stay in YOUR pocket! Think of the environmental benefits! Each time you reuse a cartridge, you save the raw materials- oil, aluminium, trees for packaging and so on - that has gone into making a complete cartridge. You save as much oil again in the energy needed to convert that material into the finished product. Finally you prevent one more non-biodegradable cartridge from entering a landfill site. Makes you feel good doesn't it! So do yourself a favour and buy a bottle now! 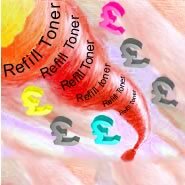 If you don't find the right refill toner for your printer here, we suggest you try www.TonerTopUp.co.uk who carry the widest stock range in Europe and will probably be able to sort you out!